OBAMA ADMINISTRATION ASKS SUPREME COURT TO OVERTURN LOWER COURT RULING AGAINST MOUNT SOLEDAD MEMORIAL CROSS. I didn’t have much faith in Attorney General Eric Holder.I didn’t believe the Obama Justice Department would join such faith-based organizations as the Liberty Institute and the American Center for Law and Justice in appealing to the U.S. Supreme Court to settle, once and for all, the long-running legal battle over the Mount Soledad Cross in San Diego. But Holder came through yesterday. The Justice Department asked the nation’s highest court to consider the ruling last year by a three-judge panel of the San Francisco-based Ninth U.S. Circuit Court of Appeals – the most liberal, most activist federal appellate court in the country – that the cross must be removed because it stands on publicly-owned land. Because the Justice Department has joined the appeal, it increases the likelihood that the Supreme Court will actually hear the case. 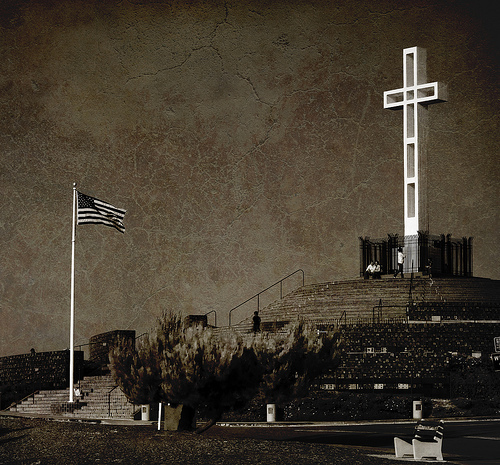 The lower court’s decision, Justice stated, “effectively invalidated an act of Congress,” a 2006 law authorizing the city of San Diego to transfer the land on which the Mount Soledad Cross stands to the federal government for use as a war memorial. The Justice Department petition almost reads like it was written by Kelly Shackelford, CEO of Liberty Institute, or Jay Sekulow, Chief Counsel for ACLJ. While the evangelical community has its differences with the Obama adminstration on a number of issues, it should be quite pleased with Attorney General Holder, with the Justice Department on the issue of the Mount Soledad Cross. 15 Mar	This entry was published on March 15, 2012 at 9:44 AM. It’s filed under Courts and tagged ATTORNEY GENERAL ERIC HOLDER, JUSTICE DEPARTMENT, MOUNT SOLEDAD CROSS, SUPREME COURT. Bookmark the permalink. Follow any comments here with the RSS feed for this post.